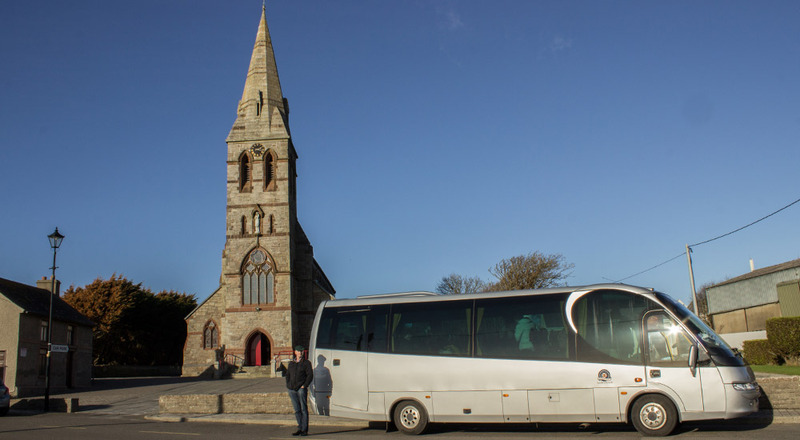 Wexford Coach Outing - 12th November 2017. 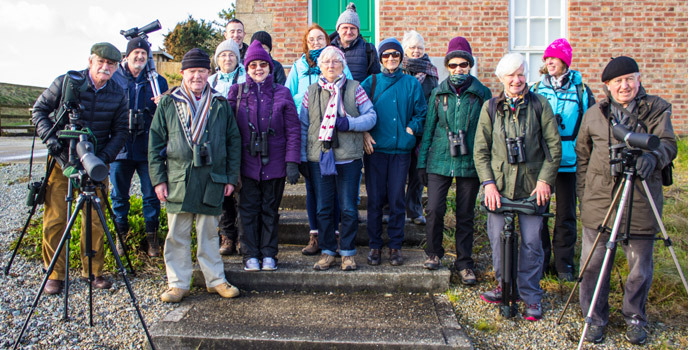 South Dublin members outside the Wexford Wildfowl Reserve Pumphouse. Picture by Bill Rea. We made our annual foray to Wexford, the Mecca of Irish birding locations, departing Dun Laoghaire at 08:30. 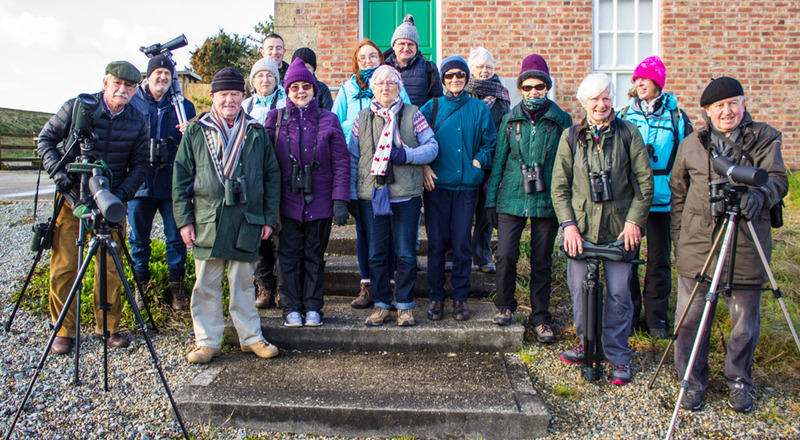 Sixteen of us set out with high hopes of a variety of wildfowl, raptors, waders etc., especially those we rarely see on our South Dublin patch. By-passing Arklow and Gorey on the M11, had us arriving at Ferrycarrig Hotel for a comfort stop ahead of schedule. By now we had already notched up five Red Kites, three Buzzards and the usual selection of corvids on the journey south. At the hotel we were joined by Stephen Bolger of the Carlow Branch, who was a great help to us on the outing and we were grateful for his company and sharp birding. 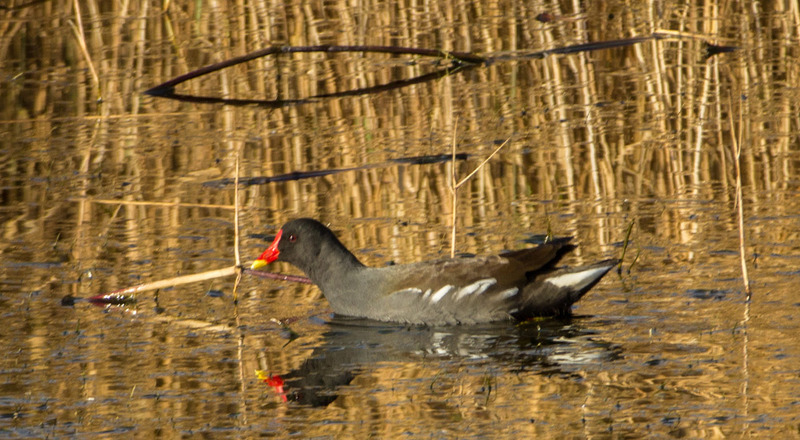 Departing from our usual schedule we first headed for the Wexford Wildfowl Reserve, North Slob. Despite a cold brisk northerly wind it was a good day to visit. The morning light was perfect and we enjoyed great views of the surrounding fields from the Tower Hide. We had no luck locating a reported Pink-footed Goose, however there were plenty of Greenland White-fronted and Brent Geese and at least a dozen Barnacle Geese, more typically a bird of the northwest. Also there in large numbers were Mallard, Teal, Black-tailed Godwit, Lapwing, Golden Plover and some Curlew. 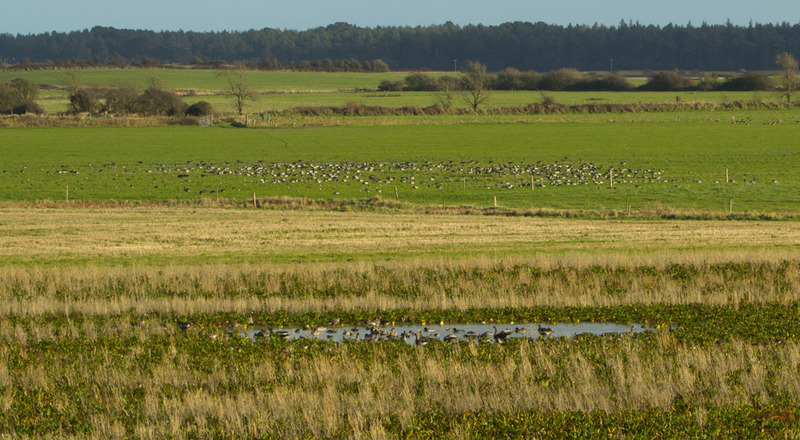 A multitude of wildfowl on the North Slob. Picture by Bill Rea. A Buzzard perched on a post did not appear to cause any frisson of fear in the busily feeding multitudes. They did take to the air several times on one of those iconic winter displays of calling and wheeling wader flocks. Geese were moving in and out of the area proving that large birds can be equally graceful in flight and a distant Kestrel was added to our raptor list. Looking out over a turbulent Wexford Harbour, we saw a great many Great Crested Grebes, in their ghostly winter plumage. Up to twelve Red-breasted Mergansers were 'ducking and diving' close to the reserve wall. We also saw some Cormorants, but alas, not the Great Northern Diver we hoped for. 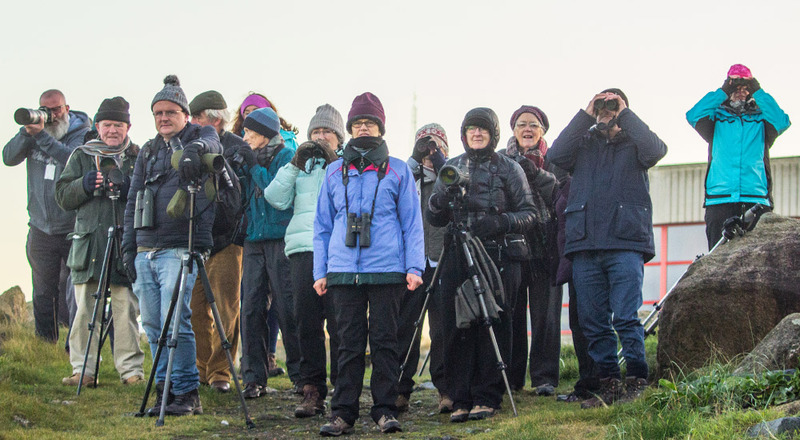 From the Pumphouse hide an Otter enthralled those that saw it and a female Long-tailed Duck was spotted in the direction of the Raven Point. Those scanning from the Pat Walsh hide saw twenty Little Grebe, Coot, a few Little Egret, Wigeon a large number of Mute Swan as well as four Whooper Swan having a break from feeding, and soaring in the distance, a Buzzard. 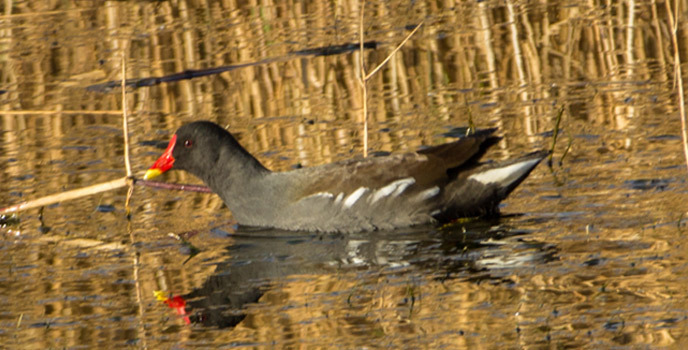 Moorhen on the go in the WWR. Picture by Bill Rea. 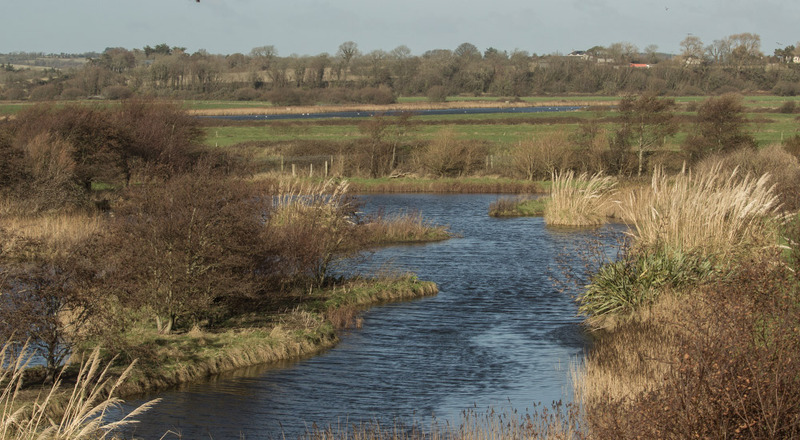 Wexford Wildfowl Reserve covers just under 500 acres of the North Slob (the rest is privately owned farmland), which covers about 2,000 acres in total. The land was reclaimed from the sea in the 1840s partly as a famine relief project. 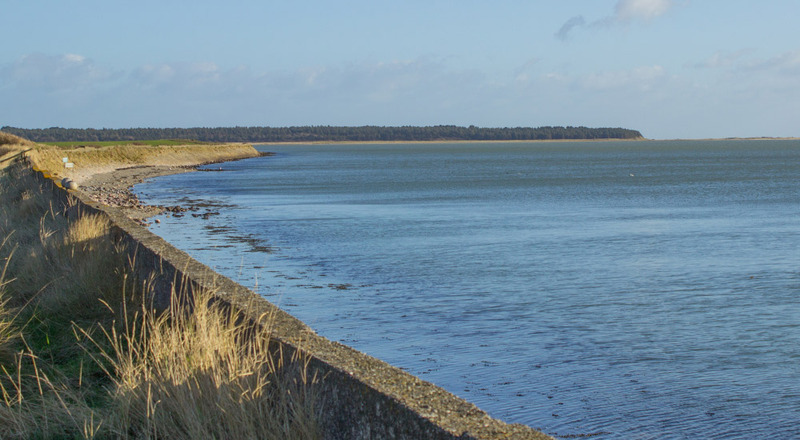 As much of it lies two metres below sea level it is protected from sea encroachment from Wexford Harbour by a sea-wall. Rainwater that accumulates on the land is discharged back in to the harbour via the Pumphouse that is adjacent to the visitor car park. 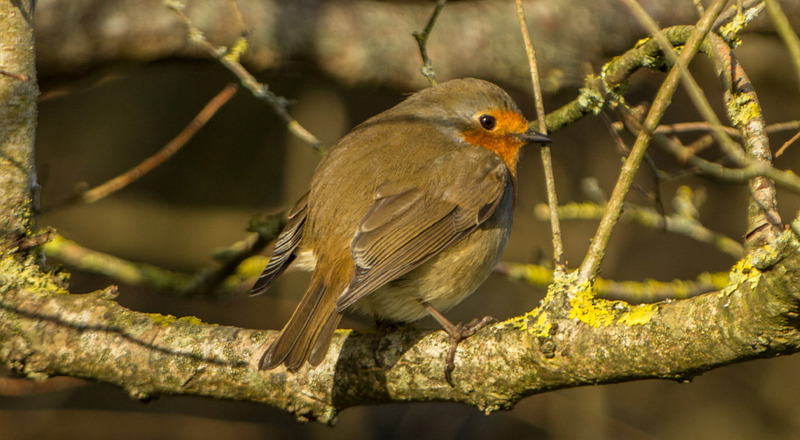 Management is provided by the National Parks and Wildlife Service (NPWS) and the reserve is jointly owned by BirdWatch Ireland and the NPWS. 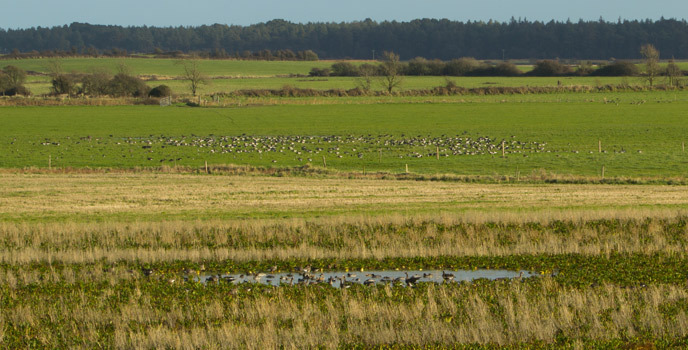 It is a wintering ground of international importance for many migratory waterfowl, especially the Greenland White-fronted Goose, the logo of BirdWatch Ireland, and about one third of the world population winter there. More information can be found on the reserve website. 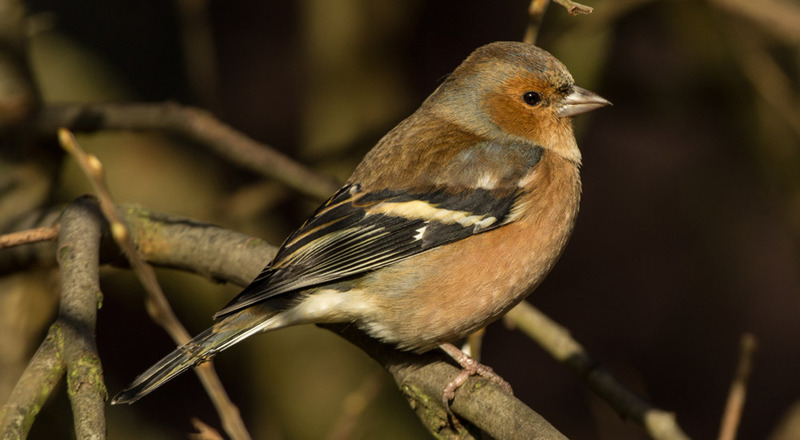 Male Chaffinch on the North Slob. Picture by Bill Rea. Our next stop was Our Lady’s Island, where we enjoyed lunch alfresco, but still keeping a lookout that produced a Hen Harrier ripping over the island, putting everything up in the process. A little later a Marsh Harrier was spotted over a wooded area to the west of the lake, all the time being mobbed by corvids. Usually good for passerines, they were scarce today but we did at least see Dunnock, Blackbird, Robin and some Goldfinch. Our Lady's Island Lake is probably best known for its breeding terns, especially the rare Roseate Tern, a bird we occasionally see during our Dalkey Island tern watch each July. Small numbers of Mediterranean Gulls also breed there. 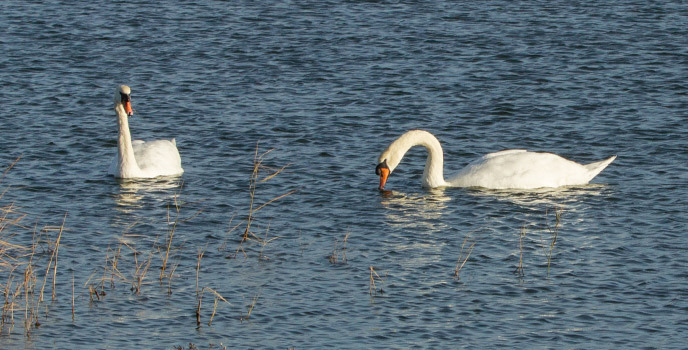 A couple of Mute Swans at swim on Our Lady's Island Lake. Picture by Bill Rea. Then on to nearby Tacumshin Lake's East End car park. 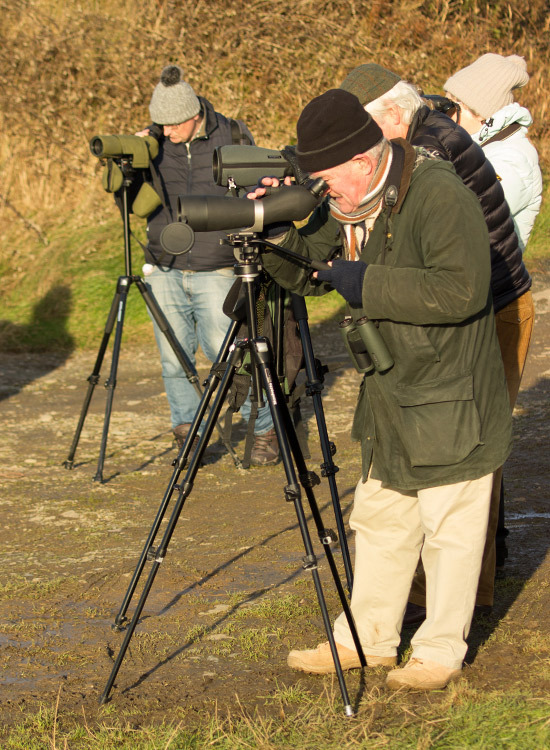 Here we met Dublin birder Noel Keogh who gave us some gen on Little Stint and a Lesser Yellowlegs at Forgotten Corner, so we headed off straight away and found a marvelous collection of wildfowl and waders there. 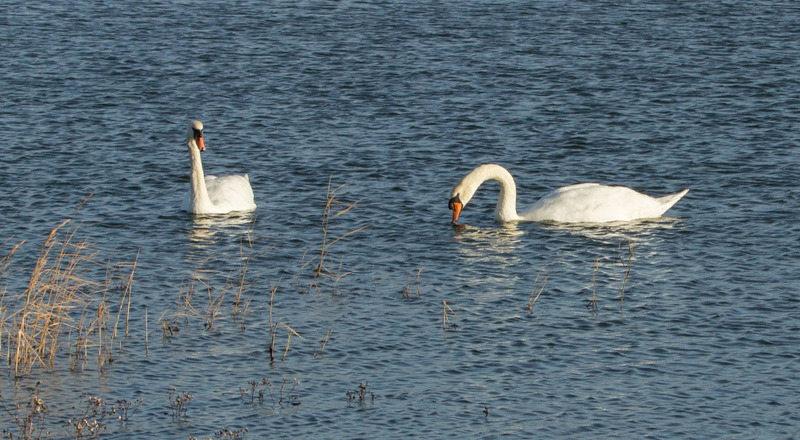 Persistent honking alerted us to a large flock of Whooper Swan and Stephen Bolger pointed out Pintail, Scaup, Shoveler, Little Stint, Greenshank, Redshank and Ruff. 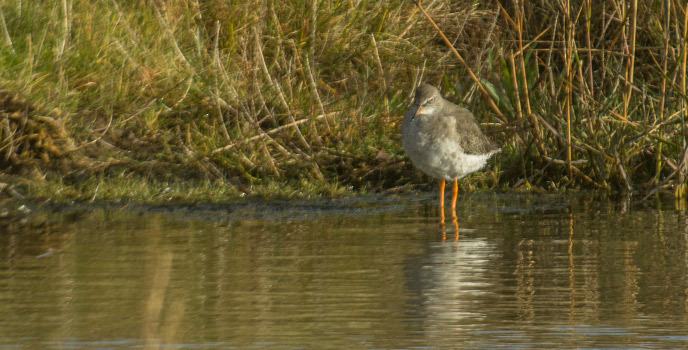 Then Robert Busby got on to the much sought after Lesser Yellowlegs. It was moving in and out of reeds, but eventually was seen by all. I was lucky to be standing close-by when Stephen called out, Jack Snipe, as three of these secretive waders flew up from the reedbed and pitched back in again almost immediately. 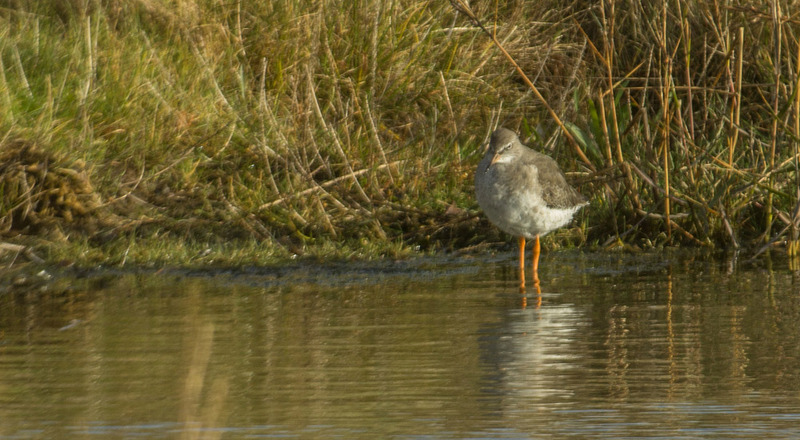 Redshank taking it easy at Tacumshin Lake. Picture by Bill Rea. On the way back to the coach, Aileen Prole found yet another Buzzard perched on a hedgerow tree. Light was fading as we set out for Rosslare Harbour hoping for Black Redstart and Stephen eventually located two that most got a look at. Also seen were some Pied Wagtail, Meadow and Rock Pipit. Finally a fly-past of some Kittiwake added to our gull count for the day. 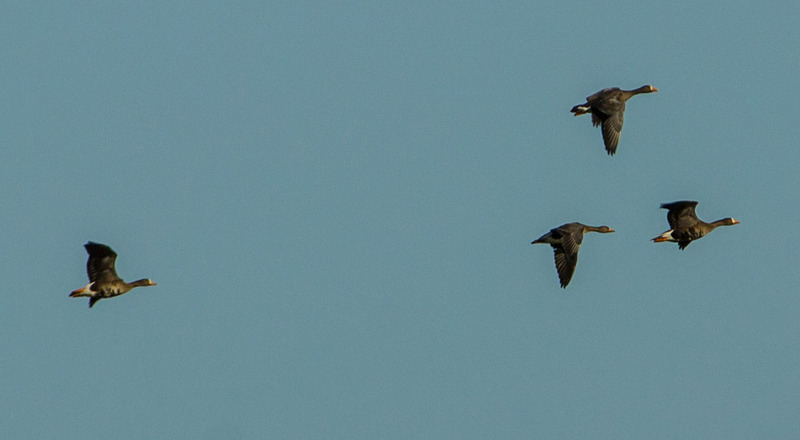 Greenland White-fronted Geese in flight over the North Slob. Picture by Bill Rea. Some more pictures taken on the day by Bill Rea. 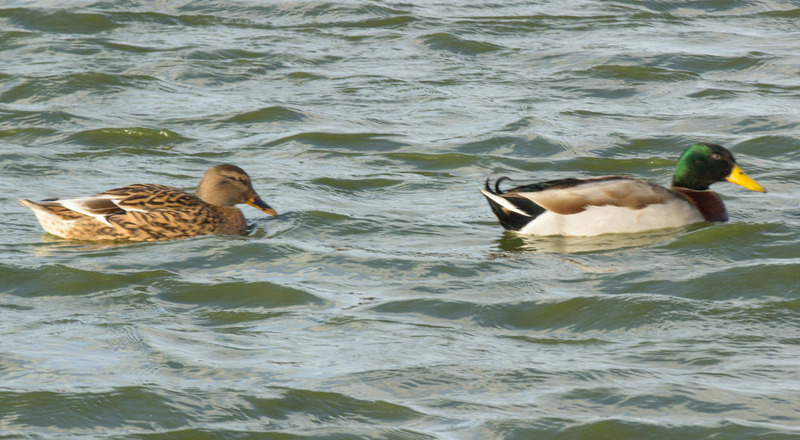 A pair of Mallard on the North Slob. Picture by Bill Rea. 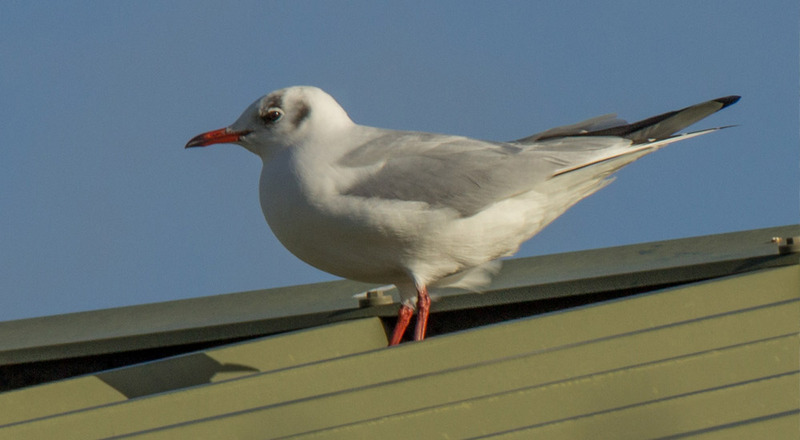 Adult winter Black-headed Gull at Rosslare Harbour. Picture by Bill Rea. Robin at Our Lady's Island Lake. Picture by Bill Rea. South Dublin memebers at Rosslare Harbour. Picture by Bill Rea. Frank working hard at Tacumshin Lake. Picture by Bill Rea. Our coach in front of the church at Out Lady's Island. Picture by Bill Rea. Looking along the North Slob sea-wall towards the Raven Point. Picture by Bill Rea. Looking east over the WWR from the Tower Hide. Picture by Bill Rea. On the journey home, we called the log and the final tally was 75 species, not bad for a few hours birding in November.